Last night I read First Contact: Scientific Breakthroughs in the Hunt for Life Beyond Earth by Marc Kaufman. it is a fast 190 pages giving an overview on several subjects like astrobiology, extremeophiles on earth, the hunt for exoplanets and various SETI programs. If you watch a good bit of Nova, Science channel and Discovery channel most of the information won't be new. Kaufman has a good style that really conveys the wonder of the scientists and their excitement at the possibilities they want to uncover. While the book is not written specifically for the young adult group, i think it would be a good one for kids at that reading level with any interest in science. maybe even for the ones without an interest! a 5 from me. 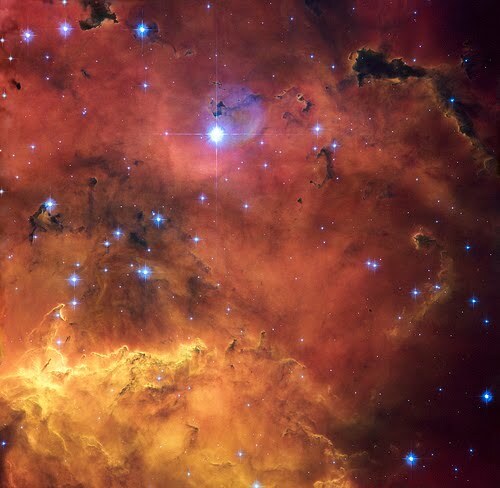 Image from Nasa's Hubble Telescope. The Future is Going to Rock! The Scariest Book I've Ever Read.